tbh sometimes I prefer straight out blow outs as opposed to him losing after having a chances. I know some people prefer it the other way but I cannot handle brainfart losses, where he has chances but just can't seem to do anything and I know thiem was playing well on sunday, but there were a couple times I was like wtf are you doing. That is basically the theory that it is better to lose in the early rounds of a tournament than in the final only this time distilled for a single match. It is always better when the player goes down more difficultly, if the concern is his performance. If the concern is one's viewing experience, it is different. The dilemma is that when he’s playing well enough to be in finals yet comes up disappointingly short at times, should we judge him by that short-term measure alone, or take the long view of his career arc and accept any result as good? I guess that’s where we’re spoiled yet I donno if the frustration expressed by @icedevil0289 is uncommon or not understandable to some extent. Personally for me it has helped to switch my viewpoint from purely from a fan perspective to see things a bit more through Roger’s eyes. I’m sure he’s disappointed when he loses too and clearly he’s competing and not phoning it in (otherwise he wouldn’t be doing as well as he is), but if he can roll with the losses for a chance to savor a few more wins, I think as a fan I should too. You’re right on the money @Tennis_Hands when you brought up the quality of the competition during Fed’s losses. The time when Roger won regardless of which day it was and who was on the other side of the net are long long gone. Yet it continues to live on in our imagination because (a) for a large portion of the ATP that still remains true, and will be so until the day he retires and (b) Roger, like a good airplane pilot who gently and almost imperceptibly begins the descent on landing, has done a great job managing his diminishing physical prowess. Taking the airplane analogy further - what we are seeing at times is Roger flying on the same level as others, yet they’re ascending and Roger is descending from his cruise altitude. We have to remember that these encounters can go either way, and slightly more often not in Roger’s favor. Case in point - the loss to Tsits at the AO, the subsequent ‘revenge’ in Dubai and now this loss to Theim. Roger is accepting of the AO and IW results because he knows if he hangs in there he also gets days like Dubai - and he’ll take that because he’s a realist. WHY IS HE PLAYING MIAMI??? Maybe he'll tank in the second round this year, like he did in 2018 to Kokk. He comes to Miami for 2 days of Moet commitments prior to the tournament and he's said his girls really love Miami. Does anyone have any news on the court speed in the new stadium? It can't possibly be as slow and high bouncing as IW. As Thiem said after the semis, "this is playing almost exactly like a clay court." Thanks, Larry Ellison. In the same interview a reported called it slow. Q. After three big finals on clay, you finally won your first big title on hard court. Now there is Miami, which is, I don't know if you heard of your colleagues, they are down there already, it's quite slow, not a really fast hard court. And then your favorite part of the season, according to your past results, has just to begin. Did you think about that? That this could be some kind of big breakthrough season if this is the start? hmm no, I don't think those two are quite the same. I'll always want fed to get as far as he can, even back in the day when it most likely would have lead to him getting beaten by nadal by the umpteenth time. However, I am talking mostly about final losses. Since there is no round after that, if he is going to lose, at this point I find it easier to digest more straight forward losses than losses where he had multiple chances, worse mps. You are describing your subjective viewing experience and I understand that. However, when it comes to losses it doesn't matter what round it is to the principle: it is better to go down while blowing MPs than to go down in straight sets. Can you spot the kid with more experience? I have my doubts that he will indeed win another major, but it would be foolhardy to count him out. The man’s lingering ambition and work ethic is strikingly apparent. The fact that he is rarely beaten soundly and almost always gives himself a chance to succeed when it counts is indisputable. Moreover, Federer still has that knack for picking apart rivals on his best days with extraordinary ease, verve and ingenuity, conserving energy in the process. Emphasis mine. “Rarely beaten soundly” is a much better way to process these losses than to think of them as an opportunity to win squandered. The latter perspective could have been relevant in the middle of his career, but these days the former will have to do. The Fedr has 55 tournaments left to try and win 9 matches. Think he can do it? Also, he averages about ~12 tournaments a year recently, so Fedr to retire in 2023? Anyone know if Roger met with Sampras at IW? I saw pics of Sampras with Djoko but none with Fed. Has the friendship soured somewhat? Sampras was at Fed's matches and appeared to be pulling for him. Seeing a lot of blind optimist here which is surprising. Fed has a deep routed issue now that will become incredibly hard to overcome at his age. The first top player he faces in an event, he loses. He is losing practically EVERY match against a top tenner that is tight. He’s so unclutch right now, and that’s not something that he can just flick the switch on again. Yeah at this point everything is a bonus, but the writing is on the wall. If you cannot win a Masters title on a hard court against Thiem of all players (credit is due, he played very well of course) then I have a tough time seeing where something will open up for him again this year. This is not even to mention the Kokkinakis and Millman monstrosities. 2017 gave us everything and none of us can complain at all. But a sense of realism is needed here. wtf semifinals against zverev too. 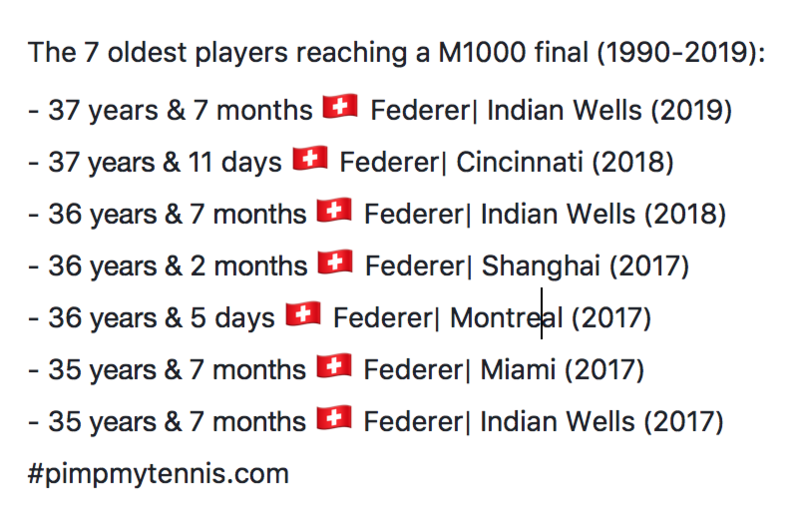 It is unfortunate that he cannot close successfully tournaments like he used to, yes, but credit where credit is due, mostly he lost finals to very big players, so it is only natural for that to happen at his age. He has produced enough miracles already to feel annoyed about any of his results (really, if he didn't produce them, now Nadal would have equalled his Majors count and Federer would have been abused by many, including the media that seemingly loves him so much, but are not really interested in tennis, but in whatever can bring them the highest ratings, which currently is to hype every next "star" and "achievement"). with ao 2017, nadal would now have 18 majors. Hm, if I remember well Rog won two top 10 matches at the WTF 2018, won against Zverev at the Hopman and against no. 11 - next week no. 10 Tsitsipas not so long ago. A bit hasty to write him off, no? Statistics aside, it's more than obvious that Roger's base level of play is already a notch higher than mid-2018 (where he was burying his FHs into the net with regularity), and that's enough as a source of optimism for me. This IW has shown that if he can bring this level of play at Wimbledon he will still be incredibly tough to put away. Unlike many I don't "award" Majors to people who haven't won them. I see this time and again: in discussions people simply assume that the player who was the favourite/was playing well would have won. That is, IMO, a mistake. If anything, the history of the sport has taught us that there is no such a thing as a guaranteed victory, and who can tell what the dynamic of the tournament, and the eventual changed competition would have resulted in? fair enough, but he would have been the favorite either against wawrinka or nishikori whatever his opponent would have been in the final. in any case, they are only speculations that only have a playful sense now. So.. Thiem vs. Fedr finals with Fedr winning this time? He's just gotta take care of that serve. That spell in the 2nd set against Thiem when he was under 50% killed him. Even though he had his chances in the 3rd, and he's obviously capable of winning final sets, it's become so important for him to win matches in straight sets. He really struggles mentally when the battle gets close towards the end these days. Hmmm... not happy to hear it’s similar condition to IW. Slow and high bounce? Uhhh..
At least Hard Rock stadium is a bit more open-air than Arthur Ashe. So it'll be humid, but not an unplayable hot box like the USO. Only good news I can think of. Fed mentioned that the ball bounces a tad lower bc of the humidity of Miami vs. the dry heat of IW. Fed felt that the partial dome results in less wind just as @MeatTornado mentioned. A faster court will help him win some more easy points (see Dubai) and help take time away from his opponents. Theim had too much time to unload in IW and the slow courts allowed Fed only 3 aces all match. If he can keep up the consistency hopefully he can have a deep run. The Fedr looks good, will win Miami... maybe Basel too . This was Fedr's practice the day after almost beating Thiem at IW19 finals. So Rog, who's your fav? Still though, I hope Shanghai doesn't end up being his final Masters title. He's played too well to go out on a losing streak like that. A popular initiative has been launched in Switzerland to rename Basel’s St Jakobshalle stadium the ‘Roger Federer Arena’ after the Swiss tennis legend who hails from the city. ... There are 8 months to collect the 3,000 signatures to take citizens to the polls on the issue. Those behind the initiative are confident of gathering enough signatures by September. Basel’s St Jakobshalle stadium holds the Swiss Indoors tennis tournament, which Federer has won a record nine times. The two politicians claim that Federer is not against the name change, but he will not speak out publicly on the matter. The 37-year-old winner of 20 Grand Slams has already been honoured in his hometown of Basel. In 2017, he was awarded an honorary doctorate by the University of Basel. But it is unlikely that a street or square in the city will bear his name in the near future as this is only possible posthumously. The western Swiss city of Biel was more accommodating: in 2016, a street was named “Roger Federer Alley”. If it happens, I hope that they are smart enough to postpone it until he retires. It is extremely cringeworthy to name facilities while the people they are named after could play in them against competitors. Didn’t remember Novak being this frustrated. Any Serbian speakers able to confirm the translations ? I dunno if this has been said earlier in this thread or if anyone else has noticed: Federer simply cannot hit passing shots including and since the loss to Tsitsipas. He's missing sitter after sitter. Even in Dubai, he was struggling to hit 'em. In his last 11 matches, you can count the number of passing shots he hit in one hand. Need a notebook for the ones he missed. He should probably be OK on dirt but I wonder how it'll affect his grass prospects. I noticed the same thing in Australia. My bigger concern is how rarely he even tries them. Given either side to choose from, he goes right up the middle more often than not. Where you hit the ball has a lot to do with your footwork. And I think he's simply not in position to be lined up to hit a proper passing shot these days. For real. Imagine if this truth comes out of The Fedr's mouth now. I think it's a certainty at this point. Only bad if said player loses a match lol. I think it would be pretty great if he announced 2020 was his last for example, won the tournament then management announced the name change for 2021 at ceremony. I was just looking at the stats from the Albot match, and it's a perfect example of how numbers can be deceiving. It felt like Roger couldn't return a 2nd serve to save his life, yet Radu only won 51% of 2nd serve points. And the overall points won wasn't even close: 104 to 88 for Roger. Not bad for what was by far his worst match of the season. GOATing since the very beginning. Is he actually talking about IW at IW? ?